The improved methodology starts with 15-meter resolution Landsat8 imagery to locate the statistical texture for the footprint of where people live. According to Earl Nordstrand, the improvements to the methodology came in two forms. Nordstrand is the senior researcher at Esri who developed the methodology for producing the World Population Estimate. The first improvement was to the quality of the input data, specifically the spatial accuracy of the population data. This resulted in reducing the number of cells with overly high counts of people. The second improvement was fine-tuning the model to better identify the location of rural population. The 2015 estimate shows a total global population of 7,295,737,250 people occupying 18.08% of the land area*. The table below shows the percentages of people living in urban and rural areas. *Land is the area of the earth’s land, excluding Antarctica and freshwater bodies. **Light urban represents areas that may be urban, if services found in cities are present. This estimate of where the world’s population lives is useful for many reasons. Natural disasters cross boundaries and national census data does not. Because the World Population Estimate is global, we can estimate how many people a storm, earthquake, etc. may have affected. In fact, derive population counts or average densities for any geographic features such as water sources, agricultural areas, hazard zones, coasts, power grids, etc. 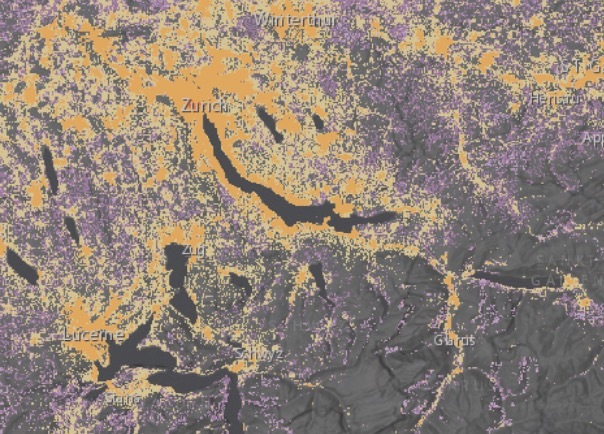 ArcGIS can also model nearness of population to these features, areas, or zones. Counts and densities are comparable anywhere in the world, whether learning about rural landscapes or concrete jungles. Use population as a surrogate for many types of pollution to model environmental impacts of human activities. This includes modeling habitat for animal species known to avoid contact with humans.